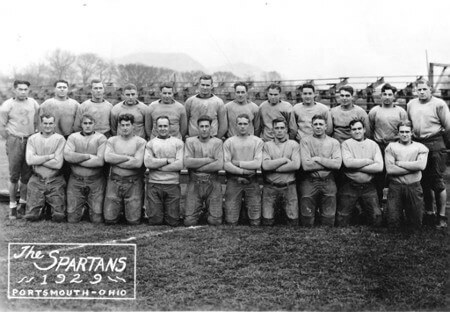 The Spartans were initially formed in 1929 in Portsmouth, Ohio, drawing players from defunct independent professional and semi-pro teams in the Ohio, Kentucky, West Virginia tri-state area. They immediately made an impact by twice defeating the Ironton Tanks, a nearby independent professional team who had regularly played NFL member teams since the early 1920s with considerable success. Portsmouth residents agreed to fund the construction of Universal Stadium, a venue comparable to those in neighboring communities along the Ohio River, prompting the NFL to offer league membership in 1930. Portsmouth became the NFL’s second smallest city, ahead of only Green Bay. During the team’s first year in the league it compiled a record of 5–6–3 in league contests.